Edge Computing to Enable Low Latency, High Capacity Applications! The network edge is a place where awesome things can happen. The high capacities and low latency at the edge enable life changing applications such as VR & AR, Advanced IoT, connected cars, E-health and much more. In fact, we are only just beginning to uncover the true power of the edge and how to use the technology to deliver applications in an efficient, cost effective way. 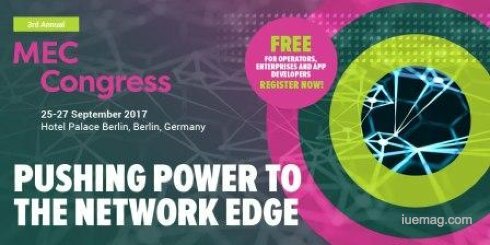 This year the MEC Congress will examine how operators are using edge compute to strengthen their networks and deliver a better quality of service to consumers. Also, how enterprises are using the edge to deliver IoT applications, robotics and new services that drive automation and reduce operational costs. The MEC Congress will showcase the latest and greatest in MEC PoC’s and trials. You will discover how this network superpower is evolving, how it will integrate into traditional networks and how it will enable the applications and services of tomorrow. What role will MEC play in 5G? Which applications will benefit most from the deployment of an edge network? How are Different Industry Verticals Adopting/Investigating MEC? Associations and Industry Bodies – Who are driving the development of MEC forward! This year our PoC Zone will form part of the main programme as PoCs are demonstrated live on stage, and ETSI approved PoCs are showcased by our exhibitors! See MEC showcased live and discover how we as a MEC community can commercialise these cutting-edge innovations. This year, MEC Congress will bring you a dedicated track of enterprise case studies that will give you a clear insight into the commercial potential of MEC! ETSI and the OpenFog consortium will once again open the conference with a series of interactive workshops, taking place on the 25th. Leaders of the associations will be on hand to ensure all your edge computing questions are answered! Even though this year’s show is in Berlin, The MEC Congress’ Oktoberfest remains! And will be back bigger and better than ever! So make sure you pack your Lederhosen! Celebrate success at the Edge Awards! Join us for an evening celebrating edge computing progression. Be sure to submit your entries and nominate those who inspire you! All entries must be received by Friday 18th August 17:00 GMT. Join the World's most innovative universities as they demonstrate key edge computing research and development as part of the MEC Congress exhibition. See the next wave of edge computing applications as they are being developed and meet the experts behind the technology. The iUeMagazine team is delighted to work with MEC Congress as Online Media Partners & is expected to bring Unlimited Inspiration for all readers from the proceedings of this event. Staying tuned to the enriching updates from this event is recommended. Any facts, figures or references stated here are made by the author & don't reflect the endorsement of iU at all times unless otherwise drafted by official staff at iU. This article was first published here on 11th August 2017. You have to LET GO! !